A horizontal band saw is a type of a band saw that allows you cutting of any particular material on a ‘horizontal’ platform; such that the table and the base of the machine lie parallel to the floor plane. 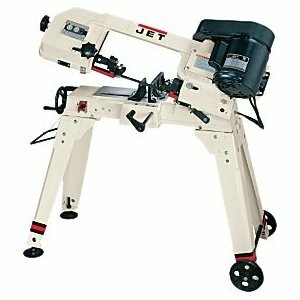 Continue to read to find out what might be the best horizontal band saw. Many people prefer using a horizontal band saw and read this complete guide to determine the various features present in such a machine and which horizontal band saws are the best in the markets. 2 Why use a horizontal band saw? 2.1 What are some of its Features? 3 Which one is better – Horizontal or Vertical? A highly versatile product, the Jet 414458 HVBS-56M is constructed of heavy duty material making it tough and guaranteed to give it’s user a long lasting performance. It offers almost all the features that may be present in any ideal vertical band saw, making no difference at all. It is a multipurpose machine that can cut through any material with its highly sharp blade and powerful ½ horsepower motor speed. 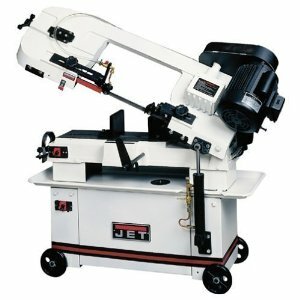 Another Jet band saw, this horizontal band saw is known for its high capacity power, besides being extremely versatile and accurate in performance. It offers a variable speed option to its user and the best thing about it is its automatic shut down option after each cut and a coolant system helps achieve the machine back to room temperature. Why use a horizontal band saw? Made of tough cast iron material that gives it strength and rigidity. Powerful motor with strong horsepower. Variable speed options for the user to increase and decrease the speed whenever needed to suit the material he is using. Adjustable roller guides and table position to adjust the various components of the machine to bring it at the required position. High capacity that allows deep cutting. Automatic shut down and cooling system that does not heat up the machine after prolonged use. Comes with a strong base so it can rest on the ground and withstand all the tension that creates whilst operation of the machine. Needs more floor space. To select between the two types, the first and foremost thing that you must consider is the space around your workspace. A horizontal band saw generally takes up more floor space than a vertical one and purchase one only if you have the space that can allow it to rest. Another thing that you must evaluate is you’re your own position and requirement. If it is for commercial use then also you must consider how exactly it is going to be used and how intensive the usage is. Balances weight in an ideal manner. Since a vertical model is standing, you need to pick up heavy planks and sheets and place them on the table. Balancing is necessarily required since this added weight may wobble the machine or some mishap might happen. But whilst using a horizontal model, you can keep all the heavy items on the floor nearby and no effort will be needed to pick up and raise them to a higher level. This will lead to applying lesser effort from the side of the user. Ideal for long duty hours and for the elderly. As this is a horizontal model, a chair or workbench can be placed in front of it where the workman can sit and perform his task. This is best suited for an elderly workman or someone suffering from any back or leg pains. Similarly, if the work requires hours of duty, then also it is feasible for the user as the vertical ones may lead to more exhaustion since they only allow work to be done while standing. Which one is better – Horizontal or Vertical? This is the question that you must have in mind right now! Well, to be honest, both of them have equal precision and accuracy and I will say that it’s best to evaluate your own basic needs, the space you have and the intensity of usage you require. If you are an elderly person yourself or if your industry requires someone to continuously operate this machine then a horizontal one is highly recommended for you as it requires lesser effort from the side of the user. So now that you have read all about a horizontal band saw, it’s time that you made a decision regarding which one to choose for yourself! Think and evaluate wisely and take your time. You can read more relevant articles guiding you to make the best decision in a timely manner.